BRUSSELS The Dutch finance minister, Jeroen Dijsselbloem, was elected Monday as the new president of the group of euro area finance ministers. Dijsselbloem, 46, who has only been the Netherlands' finance minister since November, will now face one of the world's most daunting financial tasks - helping to lead the group of 17 European Union countries that use the euro back to financial stability. Some EU leaders feel the corner has been turned in the effort to save the euro currency. Stabbing of police officers a "terrorist attack"
But at a press conference after the meeting of the eurozone finance ministers in Brussels, at which he was elected, Dijsselbloem cautioned against overconfidence. "The job isn't done yet," he said. He promised to focus on growth and further integration. "The completion of the banking union is essential," he said. Dijsselbloem replaces Jean-Claude Juncker, the Prime Minister of Luxembourg, who held the job for eight years. The Dutchman, who is 46, has been finance minister only since November. Despite his inexperience, he will face immediate challenges, including the need to negotiate a bailout for Cyprus, reducing high national debt in some countries as well as crushing unemployment, and growing opposition to austerity in some eurozone countries. Dijsselbloem had broad support at the finance ministers meeting, but Spain did not vote in favor of him. Dijsselbloem said the Spanish finance minister, Luis de Guindos, offered no explanation for his lack of support. 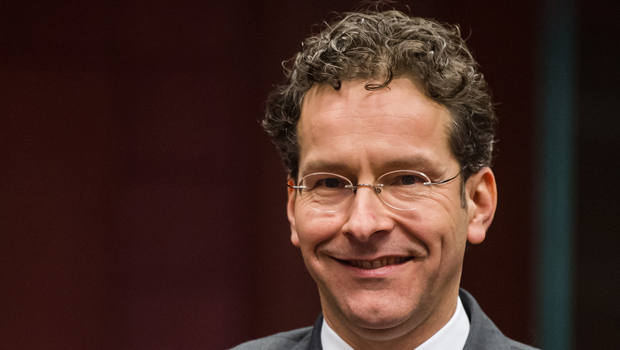 Dijsselbloem (DIE-sell-bloom) served in the Dutch parliament as a member of the center-left Labor party for most of the past decade until being named finance minister a bit over two months ago. His candidacy to lead the eurogroup came as a surprise, but he emerged as the compromise candidate among Europe's main political groups and between economically stronger and weaker nations. The Netherlands' top-notch AAA credit rating and longstanding support for German positions on the need for budget discipline, free trade and fighting inflation made a Dutch candidate a palatable choice for Berlin's center-right government. Dijsselbloem's affiliation with the Labor Party, meanwhile, made him an acceptable choice for France's Socialist President Francois Hollande. "He's the candidate, he's the only one, so obviously he's the best," French Finance Minister Pierre Moscovici said before the meeting. Juncker, who is also prime minister of Luxembourg, has over the past three years been at the heart of efforts to avoid a breakup of the euro, a currency used by 330 million people. He has weathered all-night meetings and early-morning press conferences with global markets hanging on his every word. Other European Union officials offered fulsome praise for Juncker as he held his final press conference as eurogroup president. "Jean-Claude Juncker is really one of the true and great Europeans of our time," said Klaus Regling, head of the European Stability Mechanism, the eurozone's new bailout fund. Juncker said Monday he was relieved to step down. He also dashed hopes for a quick solution to the eurozone's latest problem, the cash-strapped Mediterranean island nation of Cyprus, which is seeking a bailout from its European partners. He said a decision would probably be made in March. Cyprus is seeking rescue loans of about (EURO)17 billion ($22.6 billion) - almost equivalent to its annual gross domestic product. About (EURO)10 billion would shore up the country's ailing banks, with the remainder meant to keep the government afloat. The bailout could push Cyprus' debt to 150 percent of gross domestic product, a level economists consider unsustainable for such a small economy. In creditor nations such as Germany, Europe's biggest economy, the bailout has been met with skepticism amid allegations that Cypriot banks have helped launder Russian money and facilitated tax evasion. German Finance Minister Wolfgang Schaeuble told the daily Sueddeutsche Zeitung that it was unclear whether there would be a bailout at all, because it wasn't clear if a Cypriot bankruptcy "would endanger the eurozone as a whole at all." If Europe and the International Monetary Fund balk at bailing out Cyprus, which accounts for only 0.19 percent of the eurozone's economy, the country could face bankruptcy within months, possibly forcing it to leave the eurozone. Moscovici hinted that Europeans wouldn't let Cyprus down, stressing that the priority must be to secure "the integrity of the eurozone."